Check out our Travel Photography Guide – Transcending Travel. I’m not knocking tours – I’ve done a few in my time and know that while it’s great to travel at your own pace that tours have some good things going for them. However, these ‘photo stops’ do no really lend themselves to creative and unique images. I suspect most of the 40 tourists on the bus end up with pretty much identical images to one another (and 99% of tourists on every other bus that goes by). 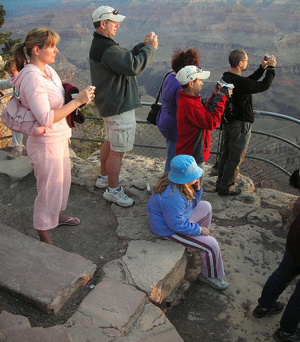 99% of photos that I saw taken by my fellow travelers on my last trip were taken from the same vantage point. One of the first things I did on a ‘photo stop’ was to find more interesting spots shoot from. Walk up the road a little, walk to the other side of that castle, look for a higher vantage point etc. It is amazing what can be achieved even in just a few minutes by searching for a vantage point with a little difference. Time might not always permit to fully explore a location but often tour guides will be willing to extend a stay at more interesting sites if you simply ask. I’ve written before about how shooting from different angles can add creativity and interest to your shots so I won’t go into great detail here. But get down low or find a way to shoot down on a subject and you’ll be surprised just how different your shots can be from your fellow travelers. On my last trip I traveled with a couple of lenses that constantly caused my fellow travelers to look at my shots at the end of the day with envy. I took a 70-200mm lens and a 17-40mm lens. This gave me a very wide spread of focal lengths to choose from, something that added a lot of variety to my shots. Wide angle shots can be breath taking – both when shooting landscapes but particularly when shooting street scenes and portraits (you get all kinds of interesting angles). Some of the best shots from my last trip were shot at 17mm and I came home wishing I’d had something even wider. Having a long zoom when traveling can give you opportunities that most of your fellow travelers won’t have. Being able to get a tightly cropped shot of the castle’s turrets or being able to photograph the dancers at the show that villages put on for you can be the ‘wow’ shots in your album. Fill Your Frame. Weight – big lenses weigh you down. Damage – changing lenses on the fly can be a bit risky both in terms of dropping gear and getting dust into your camera. Take care. Time – changing lenses too much can mean you have less time to actually enjoy the sites of your travel. Another alternative when traveling is to choose a single lens with a wide zoom range. I still remember a time on a recent trip to Turkey when on one of these ‘photostops’ where I came across a couple of young boys playing with some spinning tops. While the rest of my fellow travelers all took shots of a view 100 meters up the road I was lucky enough to get some great shots of these local kids having a grand old time playing (I got permission to photograph them from their Dad who was watching on). While I love a great landscape shot I find that it’s often the shots of the local people in a location that can really give a good feel for the places that you travel to. Keep in mind it’s worth asking for permission when photographing strangers. As I look at my own previous travel shots I notice that I take a lot of images in the horizontal (or landscape) format. Perhaps you’re different to me but horizontal framing seems to be more ‘natural’ for me and I need to remind myself to think about vertical (portrait) framing. One type of subject that can say so much about your location and which adds interest to any travel album are signs. No matter where you are in the world you’ll find signs telling people where they are, how to behave or pointing out some aspect of a location. Photographing them can be fun, inject humor and give context to the shots you take while traveling. I still remember coming home from my first overseas trip as a 16 year old (I went on a school band trip to Malaysia) and showing the pictures that I took to my parents. They pointed out to me at the end of the album that I’d managed to photograph most of the buildings in Malaysia but didn’t have a single picture of those I was traveling with (or myself). People add so much to photographs – whether it’s those you meet on the road or those you’re traveling with and not capturing them can leave you disappointed when you get home. They can also help to show the cultural differences between the visitors you’re with and the local area. When on an organized tour with others there can be limitations on how much time you have free for photography. Not everyone on the bus will share your passion for getting unique shots so you’ll want to utilize your spare time carefully. Most tours give free days and nights – use them wisely. When you get to a town or city where you’ll have free time look up the local attractions and ask locals for advice on what to see. Another good way to scope out the scenic sights is to check out postcard stands for the sites (postcards can sometimes give good examples of composition and vantage points too). 11. Turn around and look at the other side of the bus! Some of my favorite shots are the ones I've taken on the side of the bus opposite of the castle / garden / landmark / attraction. It's funny how many times I've compared shots with others on the same tour as me and heard " Wow, I didn't see that!" great tips, most of the i am already applying, but #10 is totally new to me, although it makes sense :) thanks. There are some excellent tips above, so permit me to add a couple of my own. 1. Stand beside a building or place where there is a market or walkway or some other interesting public place. Set up your camera at hip height with a medium wide angle, say 35mm, put it in manual mode, aperture priority, at f/8, and pre-focus for the zone where people will walk into your shot. (I am assuming you are in a bright area, which will give you shutter speeds high enough to "freeze" the action). Use a remote control cable and DO NOT look through the camera. In fact, turn your head away from where your lens is pointed, but DO look out the corner of your eyes to see who and what is coming. Press the shutter as colourfully clad people walk by or things happen. You will find that people will notice you first, rather than your camera. The poses as they walk or stroll along will be more natural, and you will achieve some unique images, never to be repeated! Why hip height you ask? Because if you want a natural rendition without distortion, (bending of images, where buildings and people look like they are leaning backward or forward) this height will achieve the desired result. Also, if the camera is standing by your side on the tripod, it looks like it is not in use! This is where the remote control cable, fired from behind your back - works well! 2. Pick a scene where people are seated, say at a park, bus stop or some other busy place. Lower your ISO (if shooting digital) to the lowest setting (on most cams it's 100), then turn your aperture to f22. Add a polarizer. The goal is to get your shutter speed down to 1/2 or 1 second. Once you get there, shoot the same way as outlined above. Now all the surrounding buildings will be tack sharp, and hopefully the people seated will not have moved. But anything else in the frame that is not static will be moving, giving you this interesting image of people watching the world go by. 3. Night shots! What more can be said.. when the sun goes down, and buildings, parks, and so on light up...this is the time to catch some unique images. Shoot in the rain, and catch reflections off of the wet pavement. Most night shots look best for definition and colour, 45 minutes after sunset, when there is a nice cobalt blue sky. Great tips! Especially the one about including people (ie myself and other people that I'm traveling with) in my photos. My friends always mention that they never see people in my pictures! Better still before you go - buy a Sony GPS CS1, I used one around my latest trip to Japan and it provided a full track of every place I visited, when I got home it was a simple matter to add geotags to all my photos by importing the logfile. I'm a first timer making comments. Wow I'm not alone!! I have the same issues as many others. Thank you for the ideas and handy hints. Thanks, a nice piece of information. Put away the camera? NEVER! Another tip to learn from other photographers: during the "planning phase" I look for photos on Flickr related to the location which I'll be visiting. Flickr allows you to sort photos on their "interestingness", so the top rated/mosted viewed/most commented photos will be shown on top. I know it's probably better/more fun but if you are still learning and don't have hours to spend on the location Flickr can help you to find great angles/compositions and maybe even some hidden places. Great tips, and I would add my guiding principle to your list. Take as many photos as possible at each location using various techniques and settings. In China I used more Kodachrome a day than most of my tour companions used the whole trip but I have one great photo of every place we visited. With digital there is no excuse to not take those extra frames, just remember to put the camera away and experience the place as well. yet another fabulous post from DPS. I really enjoyed this one. I tend to travel with 17-70 and a 70-200. It covers most of the needs. But at times you need a prime lens like a 50mm or 100mm for candid people shots. These are some great tips - especially the one about the lens choice. I often find that armed with just my 24-105 (on a crop body) I'm constantly looking for something wider. I usually carry the 10-22 with me to fit this need, but you've got me thinking about carrying the 70-200 instead of the 24-105... perhaps that middle ground isn't as necessary. Makes a good case for the 70-300 DO that canon has - lighter and smaller than the 70-200 and a super fast f/2.8 isn't really the most important element with travel shots. I would agree with Raquel. I like to put together a list of items that I might want to look for and take pictures of should I feel my creativity getting a bit stale. I tend to like to "collect" things via photography and end up taking pictures of a lot of mundane things in what I hope are in interesting ways. Items like street signs, manhole covers, meals, graffiti, trashcans, etc... can make interesting subjects. Don't forget though that to other people your home is a tourist destination. Just because something is banal to your doesn't mean that it is to others. To the school boys in the photo above they're having a perfectly normal day. The fascination from the shot is that it's different from our normal day. If you're going to be putting photos on a web site don't forget that there's many of us living in very different places. Not everybody is in America - I'm in Bangkok. Your banal local photo can be an interesting travel photo to me. As everyone else said, great tips. It's so easy to fall into the trap of just getting the "standard shot" for whatever attraction you're visiting, but when you pry yourself away from the easy way out, some really amazing stuff can happen. I'm looking forward to trying these tips out on my next vacation. I haven't had the opportunity to travel for pleasure, but I hope to real soon. My Dad just got back from a trip to Taiwan and Borneo, and he keeps rubbing it in my face with the occasional random photo via email. He did it right, though -- no travel tours. He didn't have much of an agenda before he left, but he managed to get four weeks worth of activities done. He managed to get some really good shots while he was over there. Another idea is to do some research before you set out on your trip about the locales you'll be visiting. Then you can jot down a few photographic ideas. For example, you might do a series on the different types of restaurants and food you encounter.